Bug report will not reach you in all these cases. Then what? Well, we have several techniques for dealing with network delivery problems. EurekaLog will try to send report via first defined send method - say, a bug tracker (FogBugz in the screenshot example above). If sending fails for whatever reason - EurekaLog will attempt to send via next available send method (SMTP client in the screenshot example above). And so on - until send succeeds or no more send methods are set up. 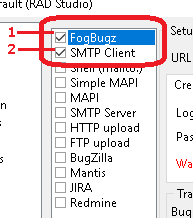 We usually recommend to use some bug tracker; followed by SMTP client; and Simple MAPI as last resort measure. Second, if send fails (meaning all send methods) - EurekaLog may be set up to copy bug report file to My Documents folder. See "Save bug report copy to My Documents folder" option. The user will be notified about it (assuming you have set up a failure message to be visible). The idea is that user can pick up this file and send it to you (developer) manually via any available means. You may change backup file location and/or file name by using OnCustomFileName event handler (you are interested in AFileType = ftZIPCopy). Additionally, report can be copied to the clipboard (both as file and as text simultaneously) - via "Copy bug report to clipboard" option. The idea is that user will be able to launch e-mail client (or go to support form on your web-site, etc.) and paste report into message. Finally, you may assign event handler to be called on send failure and perform you own custom actions (like saving bug report file to some sort of storage). For example, you may assign OnExceptionAction event handler and look for (AEurekaAction = atSent) and (AExecute = False). AAdditionalInfo will hold error message from sending. You may perform your recovery, and even switch AExecute to True to indicate successful send (so error message and creating backup will be skipped). If you did not alter "success" state of failed send - then OnExceptionError will be raised with AEurekaAction = stSent. You may perform your recovery there, and even swithc ARetry to True to retry sending. See also: How to get file name for bug report? EurekaLog do not have such feature, because of many implementation issues. • How should EurekaLog limit size of this storage? • How often should EurekaLog clean it? • What if application is uninstalled: who will clear the storage? • How uninstaller will know about EurekaLog's storage location? • Who and when will resend reports from storage? • Should EurekaLog resend on application's startup? • Should EurekaLog resend when another exception occur? • What if application is non-GUI? • What if startup time is important? • What if next exception never occur? • Should EurekaLog monitor network for availability? • What if application is a DLL or COM object, e.g. it can not run by itself to resend reports? • If you will perform sending from another process - what about firewall? Your application may be allowed in firewall, while some random background process is not. • How EurekaLog may inform user that issue was fixed? There are too many questions without good answers. That is why this aspect is currently left for your own implementation. You may create a subfolder in APPDATA folder; copy backups in that folder; resend when you can; may be create a standalone send application; clear subfolder when necessary. Refer to Implementing offline storage for bug reports article for a sample implementation. • How to get file name for bug report? • How to assign event handler?